Marlin fishing first put Los Cabos on the map but today it’s better know as Mexico’s premier golfing destination and the country’s finest course is set most dramatically on the southernmost tip of the craggy Baja California peninsula alongside the sparkling Sea of Cortés. Cabo del Sol is an intoxicating mixture of seaside and desert golf. It’s a dream location for a golf course and the design responsibility fell to Jack Nicklaus. The Ocean course opened for play in 1994. “The best piece of golf property in the world” was how Jack described Cabo del Sol and the Ocean course is a Jack Nicklaus “signature” layout and perhaps it’s his finest creation after the fabulous Muirfield Village in Ohio. The finest element of this course is that it is not obviously a Nicklaus layout. The course flows gracefully, following the natural curvature of the land. The Ocean course is also routed intelligently in two nine-hole loops with the sea is most definitely in play on five holes. It’s a nicely balanced course with no weak holes and, in typical Nicklaus fashion, there are some strong par fives which will tempt the big hitters to have a go in two. The 16th, gentle downhill dogleg par four, heralds the start of "the best three finishing holes in all of golf," according to Jack Nicklaus. With its newly lowered green, which brings the ocean into view, this is undoubtedly one of golf’s prettiest holes. The 17th is Cabo del Sol’s signature hole, a dramatic par three where the tee shot must carry a full 175 yards across a sandy cove to reach the safety of the green. The 18th is a strong par four which doglegs to the right hugging the shoreline and it’s a cracker. The Ocean course at Cabo del Sol was a great layout from its inception but it was given a facelift in 2002 by the Golden Bear and now it’s even better. We think it thoroughly deserves its accolade the “Pebble Beach of Baja”. This course certainly has many "wow" holes along the ocean and is a stern test of golf elsewise as the amount of sand that flanks the fairways means that you are having a frustrating day by hole #6 if you're not hitting it in the correct places. Still I find it difficult that this course lands in the top 100 on some lists as it is a wonderful course but is overshadowed by Dunes at Diamante and Quivera (along with growing competition from the other new courses in the area). As has been mentioned pace of play can be a problem but it's not hard to admire the views as you wait. Worth playing but I'd play some other courses in the area if I have the access prior to returning. One man is responsible for creating the growth for golf in the Cabo area and he just happens to be the game's greatest player -- Jack Nicklaus. In years past the Cabo area was where such Hollywood titans such as Bing Crosby and John Wayne, to name just two, would escape the glare of prying media eyes and head to Mexico for some serious world class fishing -- among other activities. The golf side really took hold when Nicklaus created a series of clubs in the early 1990's. I have played nearly 100 of the Golden Bear's designs worldwide and can easily say that the Ocean Course at Cabo del Sol is easily among my personal top five and a very good case can be made that it's Jack's best effort. Part of the success is clearly attributed to the sensational topography that lies at the core of Cabo. The juxtaposition between the Sea of Cortez, the desert, the nearby mountains and the verdant green areas that make up the layouts is truly an eyeful to absorb. The Ocean Course earns its plaudits beyond the incredible finish at holes 16-18. It starts with a well thought out routing that takes you on a marvelous adventure and does so without the intrusion of real estate as has happened at other Cabo located courses. The 1st is fairly straightforward and there's sufficient room to be found in the fairway but a series of bunkers on the right side must be avoided at all costs. Even when hitting the fairway Nicklaus mandates an aerial approach to avoid a foreboding frontal bunker. The 2nd through the 4th provide your best birdie opportunities as two par-5's are in the mix along with a short par-4 that tests you appetite for risk. When you reach the world class part-4 5th the game is on. The 490-yard par-4 is played once you cross an interior roadway when completing the 4th. The solo back tee pad provides just enough room for a foursome to stand shoulder-to-shoulder. It's also angled a bit more to the right and you must a find fairway that slides more to the right the longer you hit the tee shot. Making matters more demanding is the gorgeous intersection with the Sea of Cortex in the nearby background. Pull the tee shot and you are blocked from seeing the green. Push a bit too far and you'll be playing your approach from a desert wasteland. The green has no bunkers around it but there are fall-offs for shots that simply fail to find the mark. As you make your way to the beach area Nicklaus smartly added back-to-back par-3's. The key in doing this was to have two clearly differentiated holes. To be fair -- the holes are not in the same league as what one sees at Cypress Point's 15th and 16th -- but they are a solid contrast. The 6th playing parallel to the Sea of Cortez and at 184 yards is subject to varying wind velocities. The 7th plays far shorter at just under 140 yards and plays away from the water to a smallish target protected by several bunkers. Now after you have not played a driver for a bit of time you're forced to hit your very best at the uphill par-4 8th. The key is finding the island fairway which is engulfed by sand. There are internal bunkers within the grass area and they too must be avoided. In many ways the tee shot at the 8th reminded me of the target golf requirements you face at Pine Valley. The green is located on the far side and like so many of the Nicklaus greens is angled so your distance to the target must be calculated correctly. There's no doubt some will frankly detest the hole but often those doing so had best realize the strategic calculations that start at the tee. Playing the hole smartly is an absolute must because those doing otherwise will definitely feel some serious scorecard pain. The long par-9th concludes the outward side and it plays uphill on the tee shot and downhill to the green. Nothing extraordinary but like many Nicklaus long par-4's nothing is given away. The 10th on first glance appears benign but Nicklaus wisely tapers the fairway for those who wish to get as far down into the fairway as possible. At the short par-4 11th you must decide how to play the split fairway. Go right and be safe -- go left for the green and it's the equivalent of landing a 747 on a community airport runway. The 12th reverses direction and once again you have a tapered fairway immediately after going past the right side bunkers. The par-5 is also well defended by a series of greenside bunkers. Getting home in two is doable but the reward is only provided for those who take on the considerable risk. Among all the Nicklaus par-3's I've played the 13th at The Ocean Course is among the very best. The hole can usually play into the wind and the angle for the green -- plus its narrow waist landing area -- makes for the most exacting of shots. A frontal pin can be scary but a back left one is extremely brutal for the severity encountered. Walk off with a par here and you can certainly take a bow. Nicklaus doesn't often get credit for his two-shot holes under 400 yards but the uphill 14th is a great change of pace hole. Just 366 yards you play to a separated fairway. The landing area is quite wide but the favored side is the left. A desert wash hugs that side and the approach is played to the far side to a second area of fairway grass with the green shaped like a "T."
At the par-5 15th and par-4 16th you work your way back to the beach area. The 15th provides a good birdie possibility but the key is the drive because several bunkers lurk -- especially one small pesky one that is located in the ideal position. The 16th is the quintessential Nicklaus hole -- for right hander's a slight fade works marvelously. But don't rest on your laurels because the approach is a target that appears smaller than it is. When you reach the par-3 17th you are level with the Sea of Cortez. The 178-yard hole features a fairly large receptive green -- the key is focusing on the task at-hand because the distractions are certainly there. The 18th at 430 yards is arguably the most demanding of tee shots on The Ocean Course. The championship tee is angled to the right located just behind the 17th green. The key is trusting your site line -- staying away from the right is a must but I have seen many a player attempt that line of play thinking a shorter and easier approach awaits. The likely outcome that way -- a major shipwreck to end the day. Actually, the smart play is to go as far left as the fairway allows -- this bolsters your success rate with a far easier angle into the green which is positioned alongside the beach area. If you should play the 18th with the pin cut in the deepest left corner be sure to simply aim for the center of the green unless your name happens to be Brooks Koepka or Justin Rose. In assessing The Ocean Course one has to remember it's a resort and the range of players is far, far different than any private club -- such as what you find at nearby Querencia. One of the issues at The Ocean Course is the paralyzing slow play that routinely develops. If you are intent in playing be sure to grab the earliest of tee times. Far too many golfers fail to heed the famed Clint Eastwood expression from one of his Dirty Harry movies -- "A man's got to know his limitations." Nicklaus did a superb job incorporating the natural washes inland and the flow of the holes and the different shot requirements that are tested provide for both an enjoyable and memorable round. There's plenty of other good golf in Cabo -- but there's just one Ocean Course. How good is Cabo del Sol Ocean? As good as you can ask and for sure top 5 in the Caribbean and well deserved Top 100 in the world. I had played it in December 2014 and it was one of those course I really wanted to go back when I went to Los Cabos in April, together with Quivira and an unexpected invite to Diamante to play the Dunes Course by David Love III. But lets go back to the Ocean Course and some new things I experienced a couple of months ago. When I travelled in 2014 it was during a TTOOs Fam Trip just a couple of months after the Hurricane made quite a disaster in the area (Palmilla and Cabo Real courses had to be closed for several months to recover) and this time it was at the end of the high season with every course in awesome maintenance shape, so really could play them at their top. In 2014 we played tougher tees, this time it was with customers and we just played middle tees but in a very windy day which was quite a challenge for the entire group including so low handicappers. The first thing to tell is how well they work with big groups (we were 40 golfers), everything was set at the driving range, carts signaled with 2 yardage books on it, water in the cooler (not the hotests season but it is hot) and starter and marshalls monitoring everything was going fine. It is good to show it as everybody willing to travel could find helpful knowing that big groups aren't an issue here. About the course ... it is not new that the 6 ocean holes (5-6-7-16-17-18) are the best ones, specially the three par 3s (6-7-17) with amazing views of the ocean and also some nice forced carries although with a middle iron. Short par 3 7th could be seen as too easy but go play it with 30km/h wind from left to right and you will find scoring par was extremely good. Hole 18th might be one of the best finishing holes in America (From Alaska to Usuhaia in Argentina, because America is NOT a single country) with a demanding tee shot and a nice carrye with a middle iron over the beach/ocean. And there are some great holes in the "inside" part as both par 5s 4th and 12th, the first one with a forced carry over a tough wate area and an even tougher green to hold the approach shot. As the Desert Course, they still mantain bermuda grass coast to coast which is tough to keep healthy in the Caribbean and they do an excellent job here as well, keeping with no doubt the Top 100 Status for the Course. And again it is not bad to repeat how nice the setting of the elevated Club House is, where a nice lunch watching the ocean is one of the trademarks of the resort. And also one of the biggest proshops, with a lot of memorabilia to take home. If you travel to Los Cabos, this one is a "must play" and even consider playing it twice as first timers will find some unexpected difficulties when they play. 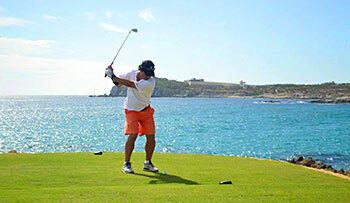 A trip to Cabo is in no way complete without a game at Cabo del Sol. The Ocean course has a strong figure 8 routing and is very walkable as opposed to some of the others here. It works its way out to the ocean for a run of visually spectacular holes before heading back to the clubhouse to start over on the back 9 to mirror the routing on the front 9. It’s definitely and rightly so been laid out to maximize ocean front spectacle and those holes really do provide some amazing views and wow moments. Waves breaking all around and even right in front of you, also architecturally some solid holes. I think this is one of Jack’s strongest efforts and that says a lot for a resort course. Pretty much since it opened Cabo de Sol has been a regular in most of the Top 100 World Ranking lists. There are many excellent holes so picking favorites is tough but I’ll admit to falling for the eye candy and breaking surf of the par 3 17th which when played from the back tees is awe inspiring – ultimate thrill in an all or nothing challenging par 3. Speaking very critically there are always holes that don’t quite suit my eye or that I simply like less. One of these is the par 5 4th hole. My main issue with it is around the green complex as there is a dry wash area before the green but it is filled with native rock formations and cactus with no way for average players that might have difficulty with the shot to the relatively small green to finish the hole unless they pull off what I consider a challenging shot. To me it’s just a touch on the extreme side – Jack designing something for Jack. In the end Cabo del Sol is a solid world ranked course, a fun challenge in a spectacular setting with perfect weather and excellent margaritas awaiting you in the clubhouse. What more could you ask for? The summary of the landscape at Cabo del Sol is: The desert meets the ocean. The summary of the golf course is: Jack Nicklaus-style forced carry shots and fast greens. The first tee shot of the day is typical of what you face all day at Cabo Del Sol: a forced carry over the desert. Often times, shots to the green at Cabo del Sol also require a forced carry over desert as well. The course starts away from the water on a desert plateau and then gradually plays downhill until it reaches the water at the par three sixth hole. The par three sixth is one of the prettiest of its kind anywhere in the world and for my money rivals Pebble Beach's seventh for scenic beauty. The dramatic par three sixth is followed by another par three, the seventh, which is a 137-yard hole that plays at a ninety-degree angle to the sixth and is parallel to the water. The sixth and seventh are the only holes along the water on the front nine. You don't return to the water until holes sixteen through eighteen, which finish along the sea. At this point, the course is routed back inland and plays up the plateau and then back down it again for the closing stretch of holes. It was a complete day spent at the Golf Club. Unfortunately we could not play the Desert Course (a masterpiece by Tom Weiskopf) but we were lucky to do a guided tour along it and it really is a must play. Then we had a clinic by Esteban Toledo in which he not only showed his very high golf skills but also explained the fitting he did for each of his clubs and how life on Tour goes along for a guy who lost to Tiger Woods twice. A very nice touch from the FAM Trip organizers before we were headed to our starting hole (4th) for the shotgun. And a very nice detail is we played with Esteban the first three holes which was a very helpful moment to see him hit the ball on the course and how he prepares every shot. Unforgettable moment for all of us. First hole is an easy starting hole where placing the tee shot is the clue. Second is a very nice3 shot par 5 and third hole is a reachable par 4, so three good chances of getting quickly under par. Fourth hole is another good chance for a birdie, a very nice downhill par 5 with an “island” green surrounded by a sand waste bunker. Fifth gets close to the ocean with the green just by it and one of the toughest holes on the course before two very nice par 3s by the Ocean, specially short 7. Then you get inland from 8 to 15 but this does not mean holes are not great!! Ninth is a great par 4, uphill for tee shot and then downhill. Eleventh a reachable par 4 with 2 fairways, the easy one and one on the left where you need a 250yds carry but which allows you to reach the green with the tee shot (I did!). Twelve is a very good short par 5 where you have severe punishment on both sides of the green if you decide to go for it. Thirteen is the toughest par 3, downhill and with a stream on the left side before fourteen which has the toughest tee shot in the course. Fifteen is the last hole before the ocean, a downhill reachable par 5 with a very severe sloped green. And then you get to the final 3 holes by the Ocean and all 3 are amazing, starting at downhill par 4 sixteen where very long hitters could get home with the tee shot (not me at all!) and where the green is just by the ocean giving it a very scenic picture. The last par 3 on the course goes across ocean and sand, a forced carry of almost 190yds to a very tough green to hold the ball. And the final hole needs a precise tee shot before another nice approach to the final green by the sea. An excellent shaped course, paspalum bright grass in pristine shape, very true and fast rolling greens and the nicest views on the destination. And also a very tough course from the tips: some long carries across desert, water and sand, nice shaped greens demanding precise approach shots and scenic views all the way, service at very high level which leaves you with the will of playing the course again immediately after finishing the round. One of the best courses I was lucky to play and for sure a must play for everyone travelling to play golf in holidays. 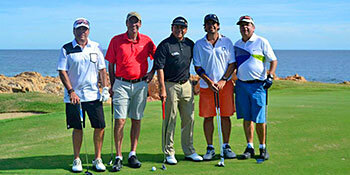 It is one of the many great courses Los Cabos has and one of the main reasons to visit the place. Jack Nicklaus using a great piece of land designed one of the best venues in the world. The Ocean course surprised me in many ways. I saw course features that I wasn’t expecting, it didn’t play like a typical Nicklaus golf course (fade, fade, fade!) and the routing keeps you away from the beautiful views of the ocean for a little too long. The scenery aside, the architecture quickly grows on you and having had the benefit of playing it 4 times on my trip, I really began to appreciate what I was attacking. If you can avoid the intimidating bunker complex on the first fairway, then you’re off on a memorial round. There’s no shortage of sand in the desert and while standing on the second tee box, you’ll see a waste area running 500 yards along the left side. It’s a never ending sea of sand guiding you up the par 5 and you can't see the green from the tee. The third hole is a driveable par 4 dotted with pot bunkers, but caps off a pretty fair opening stretch which gives the player a couple of birdie changes. The course gives a scratch player many opportunities to really think about what to hit off the tee. Driver is not always the way to go, and as obvious as that may appear, you really have to think. The fourth hole, like many of the par 5s, plays downhill and the landing area tightens up at around 300 yards to a speed-slot. If you’re not in this area, your second shot will be with a pitching wedge laying up short of a desert area. Interesting and very clear-cut, you must drive it in the right spot; otherwise, the par 5 will require 3 shots. The highlight of the front-side without doubt is 5, 6 & 7. The 5th is one of the toughest par 4s in the world with a risk/reward drive either to a fairway which could block your view to the far away green, or hit a blind drive over some cactus and hope the ball doesn't fall down into the desert. The approach shot doesn't get any easier offering a 200 yards approach shot to a large isolated green which has nothing but ocean behind it. For the first time in your game, the name of the course starts to make sense. Yes, this place has water (finally!). The 6th and 7th are back to back par 3s which make your mouth water. The 6th is 173 yards to a tight green surrounded by ocean and the 7th is a short 130 yard hole basically cut out of the beach. Just off the tee box, you’ll find vacationers hand in hand strolling along the shining sand. When you walk off the 7th green, the “Ocean” won’t be with you again until the 16th, which really bothered me. If I’m playing a golf course called “Ocean”, then I want to see the water! The 8th hole is the most controversial on the property. You tee off into a massive fairway with 2 pot bunkers that are easily avoided, but then you have the Mexican equivalent of the Sahara desert to cross until you reach the green. The 8th green and its surrounding aprons can only be described as awful. The green is shockingly unhealthy and the grass around the green has not recovered well after they removed the green-side bunkers. This hole has changed more than any other hole since the course opened. There used to be a large vegetation area between the tee and the landing area, and then the green was surrounded by bunkers. The conditioning aside, this green screamed of Nicklaus design characteristics with its raised diagonal nature with sharp fall-offs to magnetic catchment areas. The taco station at the turn reminds you of what country you’re in. Don't skip them! The back-side starts with a bland straight-away par 4, but again, you quickly need your thinking cap on when you stand on the 11th tee. Nicklaus created a split fairway on this short par 4. I was really impressed with the options I had and Jack basically said “here you go, take as much risk as you want”. The player has two fairways to aim at with a desert in the middle. The par 5s are all reachable and most of them play downhill which adds to the fun, the 12th is no different. Then out of nowhere comes the downhill par 3 13th hole measuring almost 200 yards. The par 3s on the Ocean course are visually stunning, recognised in many golf books as the amongst the best collective sets of par 3s, all very unique and the 13th stands out as a brute. The green is a small target below you and there really is nowhere to miss the green. The 14th is a dog-leg which requires intelligence with club-selection off the tee. It’s almost a plateau fairway surrounded by death. Once you hit the fairway, the approach is nothing other than a routine wedge, but with the small, treacherous landing area, this hole is all about the drive. Many of the holes on the Ocean course have big carries to the fairways and offers many great challenges, which is what separates top 100 golf courses from the rest of the pack. The 15th is a par 5 that plays downhill and presents an easy birdie to begin the home stretch. The last three holes on the Ocean course are where the majority of the photographs comes from, but I wanted this review to echo the strength of the course and focus on the architecture rather than how the Sea of Cortez plays hosts to deep-sea fisherman. The 16th is a demanding downhill par 4 with a sea of bunkers before presenting the golfer with the tightest approach shot around. You peer down the fairway to a small green with the Ocean all around you. That’s about it really, you pretty much just have to hit a career iron shot and pray that it stays on the dance floor. It’s a very exciting shot and one that you look forward to each time. Then comes the par 3 17th. It plays 150-170 yards over the rocky beach (Cypress Point-esque) which I really enjoyed the experience. I’ve played so many spectacular courses around the world that I tend to just focus on my target as opposed to getting distracted by the beach, sunset and waves crashing against the rocks. It boils down to a massive green with a ‘punchbowl’ like surrounding area to help the stray tee shot. A solid strike off the tee will pretty much give you a birdie putt. The 18th hole is not a hole that I enjoyed. The visual off the tee is an excessive combination of rocks, vegetation, cactus, houses and waste areas which all aggregated to a little bit too much for me. It basically plays as a dog-leg right along the shore and I don’t recommend hitting the driver as far too much unnecessary danger comes into play with all the surrounding nature. The approach shot is pretty routine with a short to mid iron. I would call the last hole a little boring, but the golf course was well worth the trip and by no means a push over. Having had the chance to play the course multiple times and play many of the holes with different clubs off the tee, I had the fortune of playing the holes as the architect wished and really getting a feel for the playability, design variety and shot values. You’ll enjoy the Tequila. There are some beautiful holes on this course but to be #60 in the world I believe it should have 18.The first hole is terrible as is number 9. Sure the par 3's at the ocean on the front and ,the 16th, 17th and 18 are super, but it does not deserve this spot.The service was average and the green fees expensive. Not a great 18 holes and very overpriced. Just played Cabo del Sol and would disagree about the 1st and 9th holes. Compared to the oceanside holes sure they are less spectacular but both excellent strong holes. The back nine may be one of the better nines anywherewith 10-14 verybit as good as the breathtaking 15-18. FYI they are repositioning each of the oceanside par 3 holes on the front nine with the new 7th already open. It is quite short but very tricky and standing in the middle of the ocean on the tee is a spirtual experience. Was told the 6th - also moved to the edge of the ocean - will be open for Christmas. Not a bad or boring hole on the layout.